Long before the word “robot” existed and before computers were commonly used, humans dreamed of mechanical people. Characters such as Frankenstein’s monster, the Tin Man from the Wizard of Oz, C-3PO and Mr. Data have shaped our imagination. In the ROBOTS exhibition, visitors to the Houston Museum of Natural Science at Sugar Land entered the world of these fascinating machines. 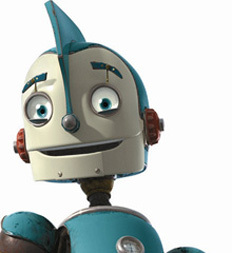 Based on the 20th Century Fox animated feature, ROBOTS depicts a world populated entirely by mechanical beings, including genius inventor Rodney Copperbottom and his friends, the Rusties, who seek to make the world a better place through innovation and determination. Enter The World of Robotics and explore both “reel and real” science of robotics. Climb aboard the Crosstown Express, featured in the film. Become a Robotic Explorer in deep space, underwater or on the surface of Mars. Build-A-Wonder-Bot that can help you out with your daily chores. Experience first-hand how robotic arms work and other Industrial Robots that have become an invaluable part of the workforce. Glimpse the Future of Robots that will re-shape our world. And, visit the Robots Hall of Fame! This multimedia exhibition captures the wit, imagination and excitement of the film and translates it into an immersive, educational experience for the whole family. ROBOTS: The Interactive Exhibition and its national tour are made possible by Ford Motor Company Fund, the community relations and philanthropic arm of Ford Motor Company. Under license by Twentieth Century Fox, the exhibition was produced by Exhibitgroup/Giltspur.